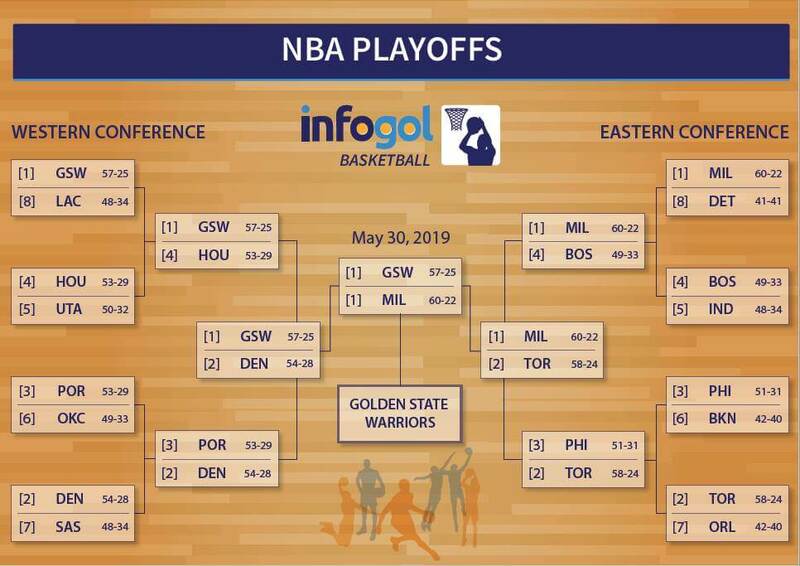 Timeform preview the NBA Playoffs starting this Saturday 13th April, take an in-depth look at the championship favourites, and explore the chances of each side to find betting value. The NBA Playoffs begin on Saturday 13th April, with the Philadelphia 76ers hosting the Brooklyn Nets at 19.30 BST. The 76ers are ranked #3 in the Eastern Conference, which combined with its Western counterpart forms two sides of a playoff bracket which will see the eventual champions crowned in late May. The #1 seed in the East are the Milwaukee Bucks, spearheaded by Giannis Antetokounmpo who led them to a 60-22 season. The ‘Greek Freak’ has taken a huge leap forward from an already lofty base and is many people’s favourite for this season’s MVP. This was, by three wins, a better record than outright favourites Golden State Warriors, who have made the finals on the last three occasions. This may turn out to be crucial, as though Golden State are the #1 seed in their conference, should the two meet it would be the Bucks who would have ‘home court advantage’. Each round of the playoffs comprises of (theoretically) seven matches, with the team who amass four wins advancing and nullifying the need to play any of the remainder. The team with home court advantage begins the series by hosting the first two games. Games three and four are hosted by their opposition, with the remaining three games alternated. This means that a ‘home court advantage’ is effectively the hosting of the deciding game seven (as well as the opportunity of getting ahead in the series). The same scenario would also apply should the Toronto Raptors meet the Warriors in the Finals, as they amassed a 58-24 record during the regular season. Despite missing star player Kahwi Leonard for large chunks, the only Canadian NBA side showed their roster strength to take the #2 seed in the East. Who will win the Playoffs? Despite their probable lack of home court advantage in the finals, the bookmakers still make Golden State hefty favourites with a current best price of 1/2 available on the Betfair Exchange. They boast a core four players in Steph Curry, Klay Thompson, Draymond Green and Kevin Durant that will be remembered as one of the great units in history. Why are Golden State favourites? It may be surprising to casual fans or those looking for a bet in the playoffs just how short they are, given their win record. One may be forgiven for expecting them to have racked up 60+ wins to justify such price. However, a key aspect to their methodology is in workload management and ensuring that they peak at the right team. Although the likes of Curry and Thompson have still seen plenty of minutes, it has been largely controlled and the fact they are still the #1 seed in the West goes someway to explaining why they have a projected 66% chance of success. ‘Anchoring’ is the term given to a cognitive bias whereby an individual relies too heavily on an initial piece of information. Whether this factor is behind the current bookmaker price of favourites Golden State, or if they legitimately should be priced at around 1.5, is the crucial element to pre-tournament analysis of our model. Should you bet on the Warriors? For the playoffs, we've built a simulation engine to model the probabilities to engineer a bracket and explore the chances of each side. Based on our playoff algorithm, we only make the Warriors a 3.19 shot, which is obviously quite a gap. This model is based on a season-long power rating (processing a matrix of results), combined with a roster rating derived from the longer-term ratings of projected starting line-ups. Despite this, our bracket projection still has them as by far the most likely winner with a meeting with the Bucks in the finals simulated 14.8% of the time (it is worth pointing out that even as the most likely bracket, this only played out 60 times out of 10,000 (0.6%). The next most likely set of results was identical, but with the Jazz overturning the Rockets in round one). 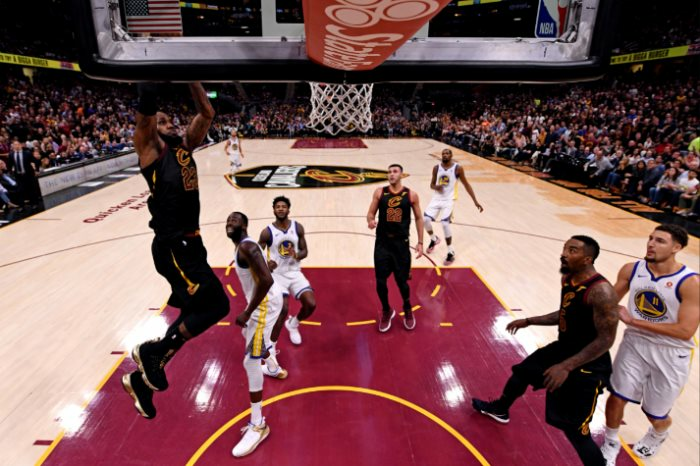 The Cleveland Cavaliers and the Golden State Warriors have contested four NBA Finals in a row, with the Warriors prevailing in three of them. This combines to give the Warriors a 47% chance of winning the Western Conference, with their biggest threat being the Houston Rockets, who we project they will meet in round two. 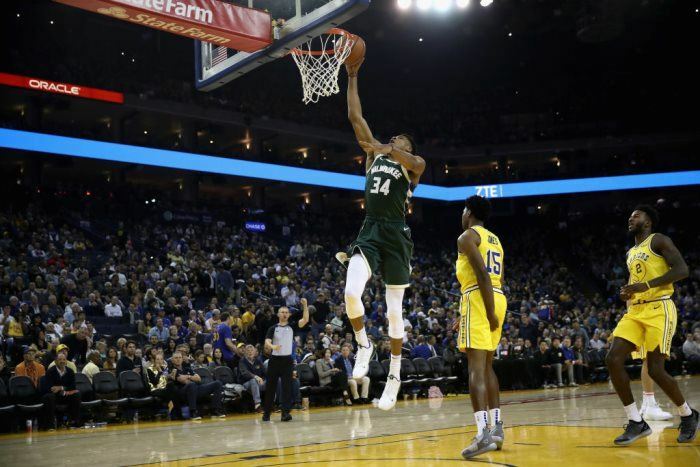 Again – although the Warriors have home court advantage throughout the Western Conference Playoffs, should they progress to meet the Milwaukee Bucks or the Toronto Raptors they would not, due to their inferior regular season record. This could be crucial and is worth bearing in mind should you be tempted to still take the price on Golden State. The major reason for the discrepancy between our model and the market’s regard for the Warriors is their ethos of managing workload throughout the season. Despite 57 wins, they barely moved out of first gear for most of the season and seemingly peaked when they wanted to. They were the one team we were out on with the model during the regular season, as when they are ‘on’, seemingly no line can stop them. There are plenty of challenges lying in wait for the Golden State Warriors, potentially none more dangerous than a repeat of their 7-game series with the Houston Rockets in 2018. Should both pass their initial tests (against the Clippers and Jazz respectively), they are set to meet in round two after a late defeat to Oklahoma City Thunder saw them drop from the #2 to the #4 seed. Much will depend on James Harden has again been a runaway leader of the point scoring title, the focal point of one of the few attacks that can match Golden State for heavy scoring runs. A well-discussed topic, the NBA has shifted to a more three-point-focused league – mainly through analytics and modelling of game theory. Ensuring clean looks at three pointers is largely the name of the game, and the sides such as Houston and Milwaukee that can generate these will be the biggest threats to Steve Kerr’s Golden State. With the outright market so dependent on whether you believe 1/2 about the Warriors is the right price or not, perhaps the better option is finding value in the opening round. A few eyebrows may be raised at the fact Oklahoma are favoured in their series with the Portland Trail Blazers. Our model suggests that even without the injured Jusuf Nurkic, Portland have a 60% chance of overcoming the fact they have lost all four regular season games to OKC this season. Want to see the stats? Check out our brief team guides and round one probabilities below. Enjoy the action!